How About a Year-Long Project? This is a post I wrote for the Label Tulip blog, but I thought I'd post if over here in case anyone was interested in trying out a year-long project. I do mention my Project Fifty-Two at the end, but there are a million other great ideas out there! As the title suggests, the goal is to take a photo every day and post it online with absolutely no photo editing. I did this in 2008. Or, rather I tried to do this in 2008. I did manage to take a photo almost every day, but the printing and keeping track of it kind of fell by the wayside. But, Creating Keepsakes Magazine has come up with a genius kit-of-the-month to take care of that problem. I'm truly tempted to try it again using this kit. It's a two-page spread for every week done with slip-in page protectors. So smart and so easy and so tempting! An artist named Kirsty Hall spent 2007 working on this. Essentially, she wrote a note on piece of paper, placed it in an envelope, drew on the envelope, and mailed it to herself every single day. I'm kind of charmed by the idea of sending it out into the universe and getting it back again. 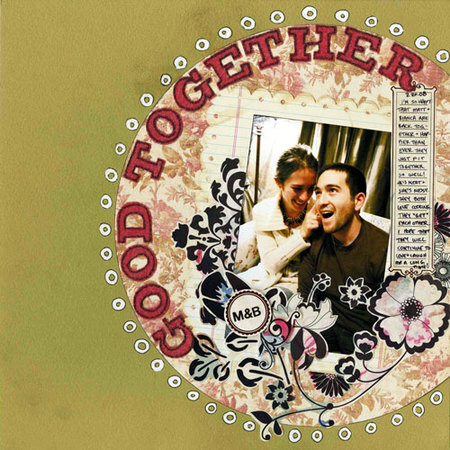 Kolette and Jason Hall of Colorbök fame are running a year long course through the online classroom, "Big Picture Scrapbooking." I'll admit that I'm a little fuzzy on the details, but it looks like Jason and Kolette will spend the year inspiring you to take risks and create a better life through crafting. Intriguing and you can either buy a month-by-month "membership" or the whole year-long shebang. The link above goes to George G's blog. He draws something - from a portrait to a doodle - every single day and posts it to his blog. I'm not a particularly good draw-er, but they say practice makes perfect. This one has been going on and on for ages. 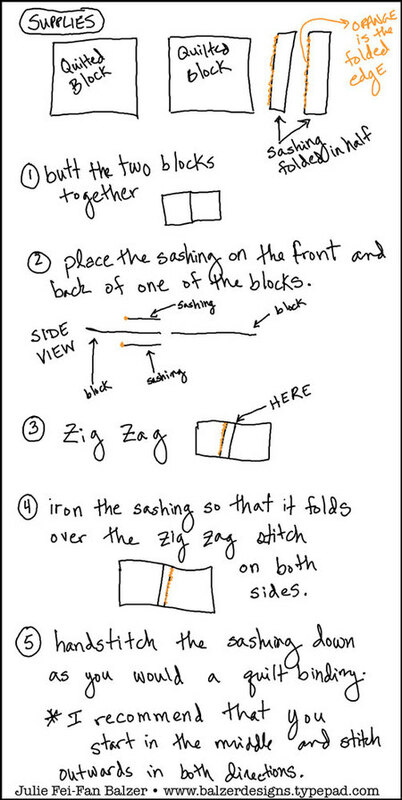 Basically, you create an 8.5x11" quilt once a week (or once a month). In addition, you're meant to keep a diary of your thoughts on doing the project. 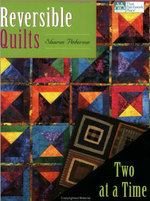 There's a great book that pulls from the first five years of the project called, Creative Quilting. It's a huge book full of inspiration! Finally, this is my own project for 2009. The idea is to get a year of your life recorded in some way. Every week for one year, participants will create something inspired by an event, a thought, or an emotion from that week. And since I dabble in lots of different things, I wanted to make sure that other people who dabble could participate. So, what you create doesn't have to be consistent. You can create an art journal page one week and a quilt the next. 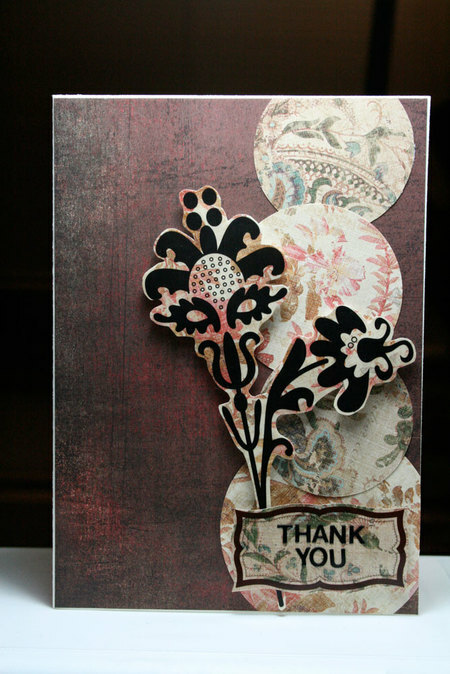 Or you could stay consistent and make fifty-two scrapbook layouts. Why not try out a year-long project as part of your 2009?! Many months ago, I bought that gorgeous Japanese fabric at my favorite quilt store in NYC, and have been hoarding it for something that I knew would come up. I didn't have quite enough to make all the curtains, so I put in a stripe of Michael Miller fabric that seemed to fit (the fabric with the writing on it). He wanted tab top curtains so that they'd have a more handmade feel. 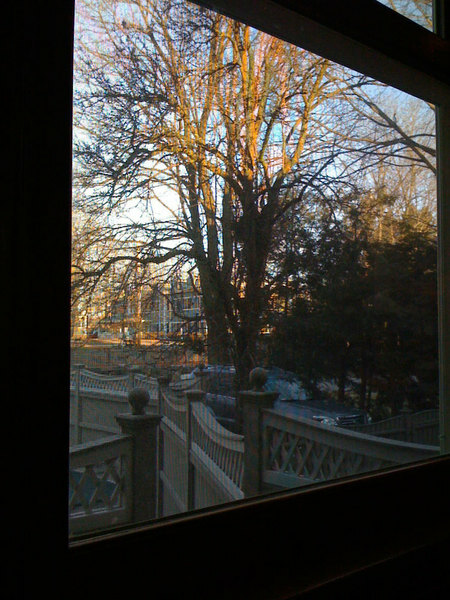 At first, I disagreed, but seeing these photos he sent me, I really like the way they look. Also, I couldn't find blackout material at a reasonable price (and in a small quantity), so I used black wool felt on the back. Not only does it do a great job of blocking out the light, but the curtains insulate the windows too. Pretty cool. 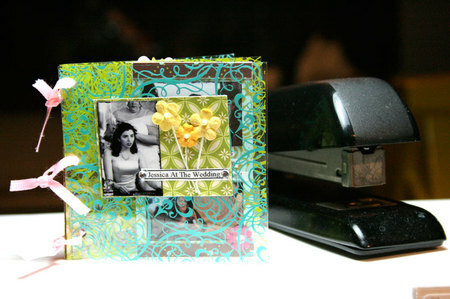 I got a late night request for a layout from Simple Scrapbooks. Yay! I'm a big fan of Simple Scrapbooks' entire approach to scrapbooking. They're all about a guilt free scrapbook lifestyle. That sounds good to me! I have been taking my Photo-a-Day, but I've been terrible about uploading it to the album on the right. Eeek. I'm in the middle of production (with a show opening on Friday) and have a horrible cold, but I promise to get to uploading sometime in the next few weeks. I am so desperately in love with American Crafts at this point. I love these stickers and the Slick Writer is amazing! It really works! The journaling on the layout was done with a Slick Writer on top of the sticker. It's amazing! I know that I already said that, but it dries immediately! I highly recommend it! I know that MaryBeth has some of them in stock at JLMS. And I believe the 30% off sale is still on! Be sure to tell them Julie sent you! 1. December 21st layout for my "25 Days Until Christmas" album. Do you have a family get-together during the holidays with extended family? 2. I'm planning on doing the 365 day photo challenge in 2008. I'm always complaining that I don't have any photos. Well, this should fix that. The assignment is to take one photo every day for a year. People will often say that their whole lives flashed before their eyes after they experienced a traumatic event. Perhaps it’s a bit morbid, but we think that sounds pretty incredible. Yes, everywhere. Get in the habit. Grocery stores, restaurants, parties, work, and school. Going to a movie theatre? Snap a pic of the flick with your phone–there are photo-ops everywhere. If you have one of those tiny tiny cameras, you have no excuse not to have it in your pocket all the time. And if you don’t? Camera phones are a great substitute. You can install blog software like Movable Type or Wordpress on your own site and create an entry for each photo, but for true ease of use, try a photo sharing site. Flickr will let you post a week’s worth of photos in 2 minutes flat, and fotolog and Photoblog.com are geared toward a photo-a-day workflow. Making it fast and easy means you’re much more likely to do it. Try to capture the day’s events in a single photo. Perform photographic experiments. Take a photo of someone new you meet, something you ate for the first time, or something you just learned how to do. Take a photo of something that made you smile. And don’t forget to take a photo of yourself at least once a month so you can remember how you’ve changed, too. Use your blog entry, or your photo description, to explain what’s going on in each day’s photograph. How good did that dinner taste? What made you want to take a photo of that stranger? It’ll help you remember down the road, and it gives friends following along a better appreciation of why you took the photo you did. You don’t need to write a lot, just enough to add some color. This is perhaps the most important tip of all. You will get tired of taking a photo every single day. Some days, you will consider giving up. Don’t. The end result is worth the effort. Remind yourself why you wanted to do it in first place. There will be times you’ll think there’s nothing interesting left to take a photo of, and times you’ll think you didn’t do anything exciting enough to take a photo of. There’s always a great photo to be made. N.B. It helps if you’ve told your friends about the project and asked them to follow along. Their encouragement will keep you going! Plan on going through and posting your photos at least once a week so you don’t get backlogged and feel overwhelmed. Ideally, post every day or two. Again, spend the time up front to make sure it’s quick and easy to post. It’ll make all the difference. I'm excited about this project! I'm going to do it a little bit differently then is suggested. I plan to print my photo each day and I've got an album ready and waiting with a tiny bit of scratch space to write any comments I want to. I also plan to post most of my photos to an album on this blog. I just don't have the brain power to run a separate photo blog, plus who knows, I may not want to share every single photo. 3. Class at Heart in Hands Scraps You can download instructions for this adorable mini (3" square) transparent album here. Thanks for stopping by!